One of the most challenging things to do as a sales manager is to determine if the person sitting across from you in an interview will be an A player. Mark Odenweller, Principal at SBI, dives into this challenging topic in this SBI article. Will he or she be the next superstar? Can this person ‘make it rain’? Can I rely on them to exceed their quota? Sales Managers consistently ask me what tips or tricks they can use in an interview to ensure hiring an ‘A’ player. Since SBI has started measuring ‘Ramp Failure Rate’ (RFR). 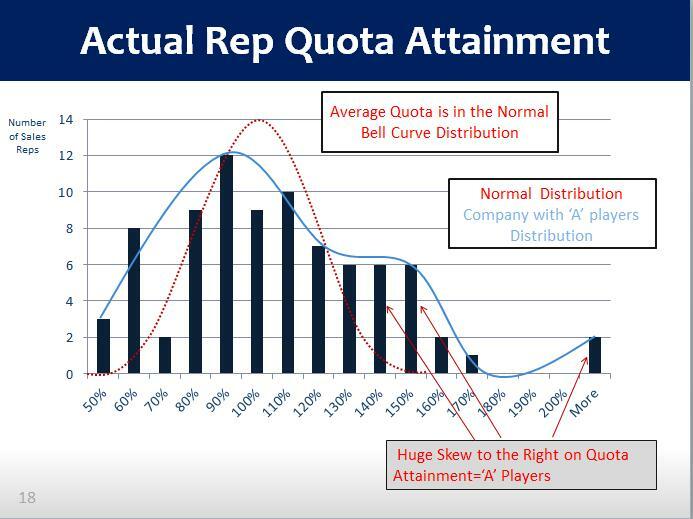 This measures how many of your people hit their quota vs. how many fail and leave the company. RFR has slowly been increasing. Our median rate 9 years ago was 42%. It is now 52%. This means 52% of all new hires FAIL. This means over half of all new sales hires don’t make their quota in year one. Ouch. The only true way to hire ‘A’ players is to have a robust Talent Management (TM) Program. This includes 5 major components: Talent Definition, Acquisition, Evaluation, Selection and Development. A good TM program will attract, select, retain and develop ‘A’ players. But what happens when you don’t have a TM program? What happens when you are actually in the interview asking questions and listening to the candidate’s answers? What do you look for at the ‘moment of truth’? ‘A’ players have a high sense of urgency. They need to get it done NOW. Whatever it is; the longer it takes to accomplish the more frustrated they become. They are ‘A’ players because they challenge the customer. The build trust with the decision maker, not just a ‘good’ relationship. Challenging customers results in increased sales. The challenge comes from the need to expedite the sale. Thus, urgency is the opposite of compliance. You don’t want your sales people to be compliant. TIP: Notice answers around work ethic matched with excitement. Passion is a key differentiator between ‘A’ and ‘C’ players. If they mention how great they form relationships, kick them to the curb. ‘A’ players have mastered the fundamentals. They don’t look for the next big product to help them make their quota. The sales process is used in every opportunity. a sales methodology, like SPIN or MHI or CCS, seems to be hard-wired. They use Call Plans on every client meeting. Simply put: They are professionals. TIP: Ask questions around how they interact with their customers and how they prepare for sales calls. Listen for the use of these fundamentals and how simple they convey it is to sell. (We know it’s not). Yes Jerry McGuire coined the phrase and almost everyone uses it (including us at SBI). It means to be money hungry. ‘A’ players want to make money. And the more money they make the better. Don’t ever think an ‘A’ player wants to ‘please his customers’. He wants to please them because it means more money. TIP: Ask what his W2 was last year (what he made last year). He will know it to the penny. Why should you spend the time weeding through average sales people to get one that’s an ‘A’ player? They exceed your ‘B’ player quotas by over 3x! This difference can set you up to make your bonus and get you promoted. Below is a Quota and Talent Assessment we performed for a large organization whose stock price has risen 35% in the past 6 months. Notice all the ‘A’ players. The VP of Sales here has a strict Talent Management Process including the 4 steps mentioned above. The results are impressive. Interviewing sales candidates is tricky. They are sales people and their job is to sell you on themselves. If they can’t sell you on themselves, what will they do with your customers? Make sure you look for these top tips to uncover ‘A’ players in your interviews. Your success is critical to hiring the top talent. These answers to your questions will tip you off on how successful they could be. For more help with talent development and enablement, leverage our “A Player” Sales Competency Assessment Tool. Visit us in and let us help you in person.